Our departure point for our canoe camping trip was the Brent Campground on Cedar Lake, and our destination was Laurel Lake – 12 kms and 1 easy portage further away from civilization. Getting there was a trip on its own that required a 3 hour drive from Ottawa and almost an additional hour on a dirt road once we left Highway 17. The forecast for the weekend was not inspiring. There was a reasonable probability that we would encounter 10 – 15 mm of rain on Saturday, but this should have been offset by a forecast which called for clearing skies on Sunday, but accompanied by higher winds. My hopes were high for some decent fall photography on our 2nd day. More importantly, this was an opportunity to spend a weekend with my son Marc that I did not want to miss out on, so I wasn’t going to be deterred by a 40% “chance of rain”. Besides, it was only a 2 day, 1 night trip – so we should be able to endure almost anything, right? As luck would have it, we loaded our canoe under cloudy skies and an intermittent fine rain, and set off at around 11:30 am. Even with shells and rain pants, 3 hours of constant exposure to light/spitting rain will eventually get you soaked! 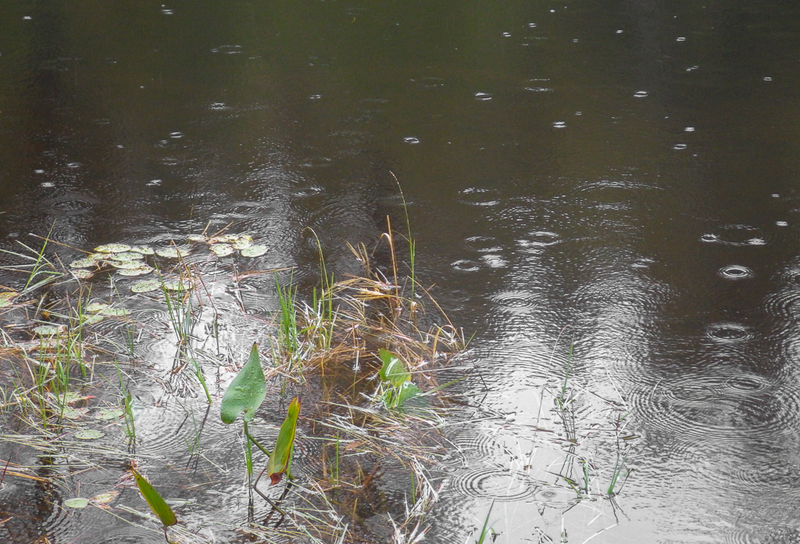 We stopped for a break and a snack at a campsite on Cauchon Creek, and watched the raindrops making circles in the water. If there was any consolation, it was that at least the air temperature was comfortable. Our route required unloading the canoe for only one relatively short portage. We double tripped it and were paddling again within about a 1/2 hour. We were now on Laurel Lake, and were within 15 minutes of our island campsite. Of course, it would be precisely at this time that the winds starting picking up, and we were heading straight into a serious rainfall. Whatever feeling of slight dampness we had was soon to be replaced with that feeling of being totally drenched. There weren’t enough trees on the island to provide any protection from the rain, and so we stood there, with beers in hand, waiting for the rain to abate so that we could set up our tent. We used this waiting time to look for dead branches to provide fuel for a campfire, but the island had been picked clean. When the rain did finally cooperate, we set off for one of the two campsites on the shore and loaded up on some seriously soaked wood. Despite our best efforts over the course of the next hour, we were not successful in getting a fire going, and we were too far off grid to be able to google solutions! And so after dinner was done, it was pretty much time to call it a day and hope that the next morning would bring better weather conditions with it. I think I slept all of 20 minutes on Saturday night. I enjoy being outdoors, but have not slept well outside for years. I got up four times during the night to go for a pee, and was sure that I saw snowflakes glimmer in the light of my headlamp at one point. I changed into dry socks and a fresh T shirt before going to bed, but as daylight was soon approaching, I turned my mind to how I was going to dry out my hiking pants. The only solution was of course to put them on and climb back into the sleeping bag where by body heat would hopefully dry them out. It takes a certain amount of mental strength to put on cold, wet clothes, but thankfully my pants were reasonably dry within about an hour. We sprinkled blueberries on our hot oatmeal, and 2 cups of coffee helped to ensure that our core temperatures would be back on the rise. It was just barely above freezing, and our wet footwear, however, ensured that our feet would be uncomfortable for all of this second day. The weather forecast was right about the wind speed on Sunday – it would be approaching 20 km/hour – and I was now concerned about the waves that might be building on Cedar Lake, which at 14 kms in length, could see some serious wave action from a paddler’s perspective. We packed up all of our rain soaked gear and were off by 9:00 am. I had hoped for clearing skies on our second day, but given the overcast skies, and residual rain, I gave up on taking any pictures with my serious camera and was resigned to documenting our trip with my little point & shoot. Travelling to a new destination always feels psychologically longer on the outbound trip than the return trip, and this was true for this outing as well. 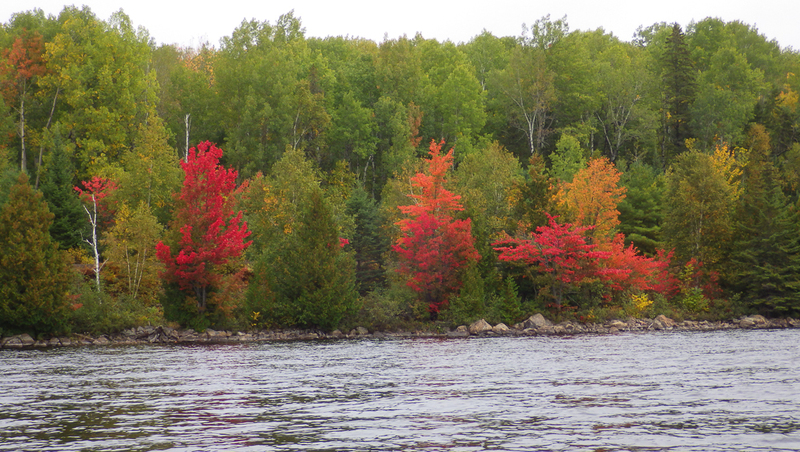 We were at the portage on Laurel Lake in no time, and made good time on Aura Lee Lake, Cauchon Creek and Little Cedar Lake before reaching Cedar Lake. With all of the rain from the previous day, water levels were higher, and streams were running faster. I had to quickly take pictures of the train bridge over Cauchon Creek as we were being pushed through by the current! We stopped for a break on Gilmour Island. The island looked uninhabited with our approach from the west, but we came across a sign warning trespassers of hidden dangers… If it wasn’t for the professional appearance of the sign, I would have given the warning the same consideration as a Scooby Doo episode! We didn’t dawdle and set off for the final leg. It was only once we were east of Gilmour Island that we realized that there was a cottage there. 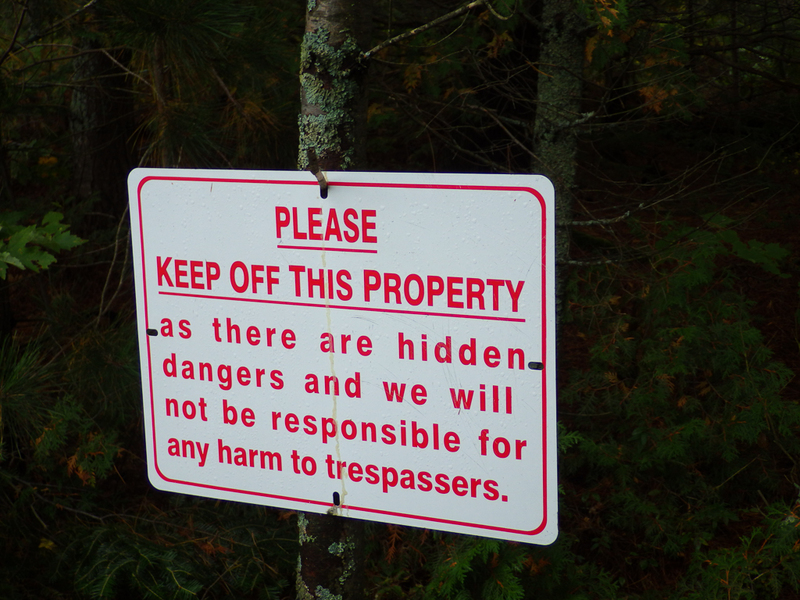 The owners must have had grandfathered property rights dating prior to the establishment of Algonquin Park. While I might not have researched campfires with wet wood prior to the trip, I did research canoe safety in high winds. One of the cautions is in terms of being overtaken and swamped by a wave. We were careful to not expose ourselves to a broadside wave, but a wave could have also filled the canoe from behind as the wind pushed us toward the take out location. The waves did come to within inches of the gunwales, but we made it back without incident. We were very happy to get the heat going in the car once it was loaded. We made a brief stop at the observation tower for Brent Crater, and learned a little about the meteorite that crashed here 450 million years ago. The picture below is of the crater, with the foreground trees delimiting the near rim of the crater, and the hills in the background delimiting the far rim of the crater. Over the years, sedimentary rocks have filled in the centre of the crater so that today, it is only 500 feet deep. The true depth of the crater is closer to 1,400 feet. The train bridge at Cauchon Creek. The current on the 2nd day swept us through the opening. been there done that ,love your pictures. doe,s your son want to go again!